This tiny acorn fell from its Oak tree and landed at my feet in front of Starbucks where Ryan and I were relaxing with iced coffee and cookies after his first day of High School. We decided there must be a connection between the potential for growth in both the acorn and a young freshman that is stronger than mere coincidence so this little nut is now part of Ryan’s good luck charm collection reminding him of all the exciting things ahead as he grows and learns about the world. How cool that Ryan keeps a collection … something he can share with his kids someday. 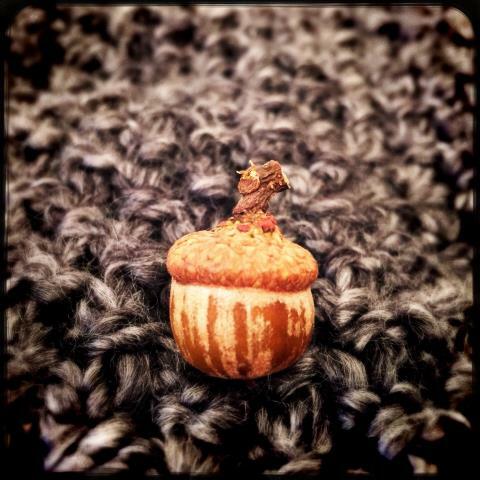 That’s a special little acorn! A message in an acorn. Beautiful !!!! I thought the acorn was a candle holder with a lit candle. The radiance of it came shining through my screen. Mystifying …!!! Your perspective and its symbolism are a captivating duet. It’s almost as if the apron is posing for a portrait. Happy Photo Challenge. What a wonderful shot of an acorn. Glad it is connected to a wonderful memory. Excellent, Lisa. Sounds like a lovely time.